Day two of the Los Angeles Times Hero Complex Film Festival in Hollywood put director Christopher Nolan on display. The director’s 2002 film Insomnia and 2008 masterpiece The Dark Knight both screened and the man himself showed up for an extended Q&A between movies. The one downside to the evening was that the words “Batman 3” were not uttered once. It was almost as if the host, LA Times writer Geoff Boucher, wasn’t allowed to say them. Other than that, though, Nolan proved he is a highly intelligent and articulate filmmaker who has really grown from his second film to his latest. We learned some news about Inception (it’s about one week from being totally done), Nolan’s thoughts on 3D (he prefers post conversion) and a whole bunch of other stuff. Click here to read about Friday night at the festival with Leonard Nimoy, check back Sunday for the final day with Ridley Scott an hit the jump for a full rundown of the evening’s session, including the way Nolan almost got tricked into talking about Batman 3. After Insomnia’s credits, they immediately rolled the latest trailer for Inception before Nolan came out. – The first question was about the casting of Robin Williams in Insomnia and Nolan called his performance “flawless.” Said the film benefited from the fact that One Hour Photo, which features a similar performance, was released after it. – They then discussed the issue of similar timing, like Nolan encountered with The Illusionist vs. his film The Prestige. He said it happened almost all the time, even with Memento. When he was pitching that, a similar script – The Lookout – was floating around. It finally got made years later with Joseph Gordon Levitt. – Nolan came directly to the event from the nearby Warner Brother’s lot where he was on a dub stage working on the final reels of Inception for early screenings. Said the film is one week from being totally done. – Editing is Nolan’s favorite part of production and finds actual production to be a bit paint by numbers. However, he says that all aspects of directing are great at the beginning but by the end you just want them to be over. – He prefers to use practical effects in most cases before resorting to digital effects and told a story about choosing between the two on Batman Begins. He said that effects are better when artists can match something real. – Inception was an idea he has been working on for ten years and actually pitched it to Warner Brothers right after Insomnia. He then told us the basic jist, nothing more. They liked it and told him to write it. He figured it would take him a few months but it took 10 years. He thinks it worked out for the best though because the film is easier to watch than read on a page so his work in between gave the studio confidence in his ability to pull it off. – Heist movies, like Inception, tend to be superficial so the time he took with the movie also helped him flesh out the characters. Leonardo DiCaprio helped with this too when he cam aboard. – His favorite scene in The Dark Knight is the interrogation because it was so technical with the lights and it brought together many of the main players in the cast. They shot it second week so that Heath Ledger could have a good, meaty scene to use for the rest of the shoot. He also said that they couldn’t have done that scene with the suit used in Batman Begins because it wouldn’t look good under that light and that it’s the first scene where we finally get to see a Batman driven by rage. 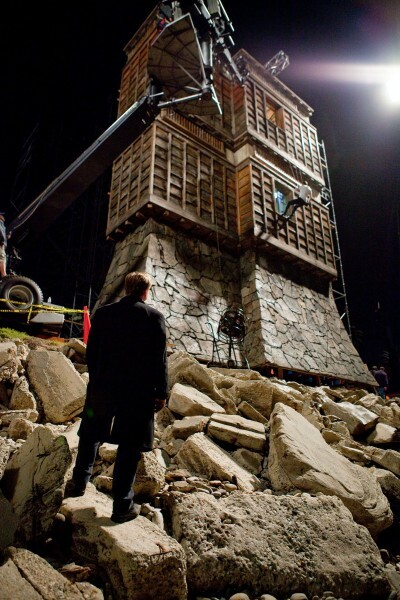 – That location was also used in Batman Begins and Inception. In fact, many of the sets for all three of those movie are all still standing in a warehouse in London. – He wasn’t aware of the fact that six of his top eight actors in Inception were Oscar nominees but he chats about them being great. – Boucher then mentioned that it was probably “too early to talk about things” but asked why Nolan, whose characters are usually so haunted, would want to be involved in Superman, who is not. He said he’s strictly on it as a producer and he retold the story of David Goyer pitching him this great idea. He wouldn’t say what the idea was but said he knew he had to help get it done. – Batman Begins was directly inspired by the Richard Donner Superman and Nolan pitched it as such. He called the Burton film “mad” and said that Donner’s structure and ensemble casting helped influence Begins. He believes that cast is the reason many of the superhero movies now have huge actors in all the small parts. – Nolan is a huge Blade Runner fan, has seen it hundreds of times and knows every detail. He talked about how it spoke to him and influenced his story telling. – He then talked about Alan Parker films, such as Pink Floyd’s The Wall, being an inspiration too, especially in their non-linear storytelling. He screened the film to his cast and crew before Inception. They were left speechless. – Jokingly said that Michael Caine claims to be his lucky charm and that’s the only reason he put him in Inception. He then went on to praise him. – Christian Bale was brought up next and Nolan talked about how he went about the screen tests for Begins and that Bale was first. After that, they shot footage with every actor in Hollywood including Cillian Murphy. Bale was the stand out, but Murphy’s performance won him the role of Scarecrow. – Here’s where Boucher worked in an “air quotes” Batman 3 question. He asked Nolan if he was amused when reading about his own casting on the Internet. Nolan got a look on his face and said that he doesn’t really look at the Internet and doesn’t even have an email or cell phone. He learned early on in the Begins process that it wasn’t a good idea to look at what the fans say. He did joke about the Cher rumor though and said the studio has called him and alluded to the fact they read those things. – The audience questions began after that. Ed Brubaker, the comic book writer asked about Nolan’s writing process. He first admitted the screenplays you read that are published are like the 15th draft and are way more polished than any one person should get credit for. Then, he added that he doesn’t outline, just prefers to start from page one and write linearly and uses a lot of diagrams ala A Beautiful Mind. – Said he wrote Joker origin stories just by spewing like 3 or 4 pages of stuff out there and then cutting back. – He was totally surprised at the success of The Dark Knight and said that its success was due to a number or reasons including Heath Ledger. Another was that people were nervous about Batman Begins because of the previous film in the franchise and the idea of a reboot was foreign at the time. By the time Dark Knight came out, people trusted it more. – Nolan is not a fan of 3D. He feels the image is too dark and it hasn’t really gotten to the right place technologically yet for him to consider. They did post production tests for Inception, which he liked, but they didn’t have enough time to convert the whole film to his high standards. – He added that shooting in 3D is way too much of a compromise of the image, and gave a bunch of very technical examples. The most interesting thing, though was Nolan said if he was to do a film in 3D, he believes the way to do it best is in post production. – Story comes first when he’s writing and the characters evolve second, mostly through the action. – The final question was some guy screaming out something about how he remade Nolan’s short film Doodlebug and didn’t really make any sense. It was a weak ending to a fun Q&A. Thankfully, we had The Dark Knight to cleanse our palates. Check back tomorrow for the final day with Ridley Scott.